The Sonoma Coast Appellation (AVA) extends from San Pablo Bay to the border with Mendocino County. 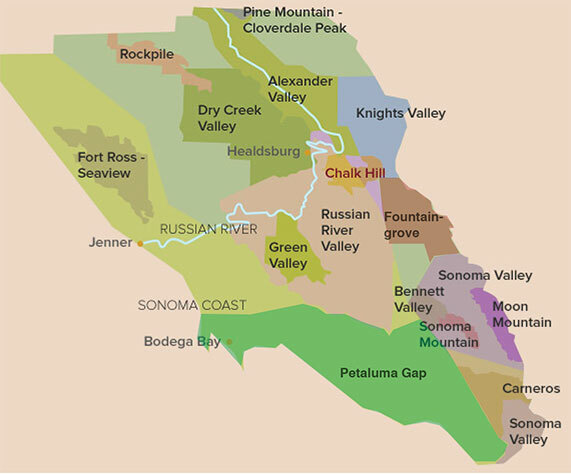 The appellation is known for its cool climate and high rainfall relative to other parts of Sonoma County. Close to the Pacific, with more than twice the annual rainfall of its inland neighbors, it can still be warm enough to ripen wine grapes because most vineyards are above the fog line. Pinot Noir and Chardonnay shine, along with cool-climate Syrah.